JESUS’ RESURRECTION: CREDIBLE WITNESSES ARE HELPFUL! It’s a very embarrassing moment for a lawyer trying a case in front of a jury when the judge says, “Please call your next Witness,” and that next witness hasn’t shown up. Witnesses are very important, and this concept of “witness” has a definite place in Christianity. “The Apostle speaks here of the living tradition of the Resurrection which he had learned after his conversion at the gates of Damascus” (CCC 639). In this famous passage (just quoted above) Paul mentions 500 hundred witnesses to Jesus’ resurrection, and he further adds that some of these witnesses have died, which means that most are still alive and can provide corroborating testimony! Five hundred witnesses would make for a long trial! Almost all of these apostles went on to convincingly confirm that they witnessed the resurrected Jesus with the witness – the Greek word “martyr” literally means witness – of their own lives, which is a most powerful testimony. Who are we today – some 2000 years later – but the living beneficiaries and stewards of the most important testimony ever given: “CHRIST IS RISEN! ALLELUIA! References: The Founder of Christianity by C.H. Dodd, The Catechism of the Catholic Church, and The Ignatius Catholic Bible Study on 1 Corinthians 15. Image: (Public Domain, U.S.A.). 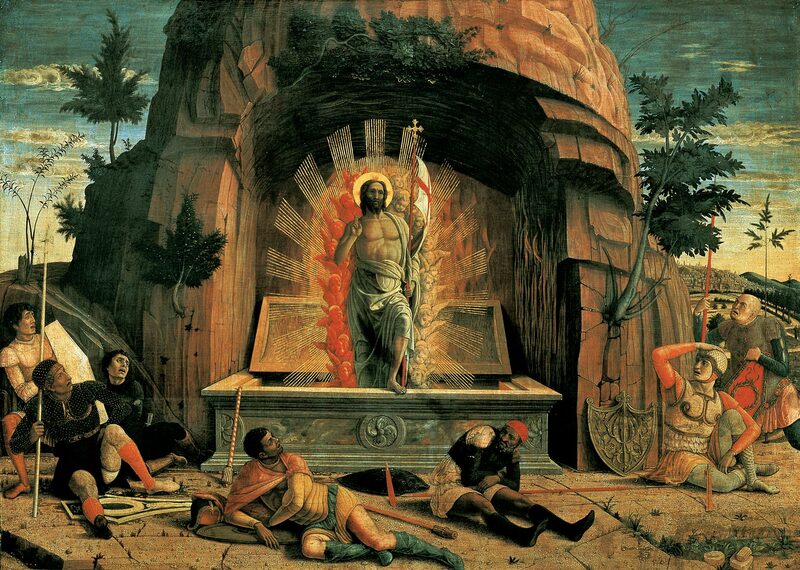 Image: The Resurrection by Andrea Mantegna, 1459 (Public Domain, U.S.A.).